New Delhi: As the budget session began, President Ram Nath Kovind addressed the joint sitting of both the Houses. The president strongly endorsed the need to explore the possibility of holding simultaneous elections in the country. He urged the political leaders to discuss the issue and try to reach a conclusion. He also underlined ambitious government target of connecting each village in India to motorable roads by 2019. During his 45 minute speech, the president highlighted major achievements of the government and the benefits of many central schemes that have been able to change the lives of citizens. The President highlighted the major decisions that the government took to improve the work conditions of labourers and farmers in the country. 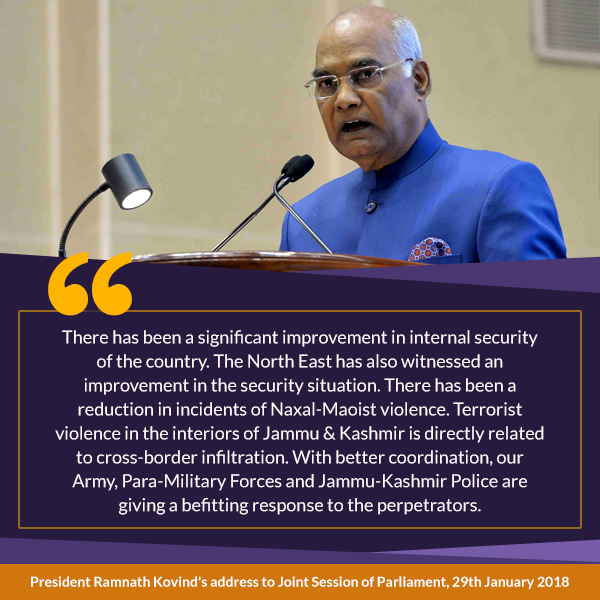 President stressed that the government is committed to empower the minority community without following any sort of appeasement. He also underlined Haj reforms initiated by his government. Prime Minister Narendra Modi urged the members of all opposition parties to join hands and deliberate on the fine points of budget proposals during the recess in budget session to ensure that its benefits percolate to the last man standing. He was addressing media ahead of the budget session of Parliament. Prime Minister also said that the budget, to be presented in parliament during this session, will fulfil the aspirations and expectations of common man. He also expressed hope that the Triple Talaq bill, which is pending in the Rajya Sabha, will be passed during this session. Union Minister of Minority Affairs Mukhtar Abbas Naqvi today expressed hope for a constructive debate during the Budget session of parliament. He also expressed hope for passage of crucial bills including Triple Talaq Ban Bill during this session. To ensure smooth functioning of both the Houses of Parliament, Government convened an all-party meeting in New Delhi on Sunday. During the meeting, the Prime Minister exhorted all political parties to collectively strive to create a constructive atmosphere in Budget Session to achieve National good.